HomeClickfunnelsSales & MarketingFunnel Builder Secrets-What is funnel hacking anyway? Funnel Builder Secrets ! What are they and why would you want to know them? Well if you have a business or even if you don’t, choosing to “Funnel Hack” your way to success is a smart decision. Now, wait a second (I can hear you saying!). First he says Funnel Builder Secrets and now Funnel Hacks, what is he talking about? What does it all mean? Let me take a step back for a minute here and explain what I am talking about. First up you need to read Dotcom Secrets by Russell Brunson. If you haven’t already read it, get yourself over to this page and grab a copy of Dotcom secrets (its free, just pay the shipping). It’s an awesome book that will arm you with the knowledge you need to get started with Funnels and online marketing for your existing business or even for that idea you have floating around in the dark corners of your brain. So assuming you haven’t quite had time to get the book, have it delivered and read it I’m going to let you in on a little sneak preview here and now. So as you may have already seen we here at Funnel Bank use Clickfunnels and highly recommend you check it out for your business. It’s the all in one Sales Funnel and marketing tool you need in your business. Think of it as a digital swiss army knife. So if Clickfunnels is so great why do I need Funnel Builder Secrets? Just like any tool you need to learn how to use it. I don’t just mean how to edit sales pages, I mean really learn how to use it. When to use it, what to use and why and in what way. Confused yet? Many people start out trying to build a website or a sales funnel with no idea how to actually go about it. Choose a tool or a platform and try to put something together and get super frustrated. Spend a bunch of time getting something half way to what you want and then try to launch it. Wait what? How do I launch? Should I use Facebook ads or Google ads or something else? How do I do those? Should I have an opt in page? ……………. and on it goes. The thing is you can spend months learning to build a website, then learning to build a sales funnel, then learning what traffic source you should use and …. well you get the idea. So Russell and the team at Clickfunnels not only built an awesome tool to allow you to design, build and launch and fully functional Sales Funnel with email marketing sequences and everything you need fast. They then but together an amazing end to end training program to take you from creating your offer to launch. You don’t need to be a tech wiz or a coding ninja. Anyone can do this. Over 60,000 users can confirm that. So there you have it. The team at Clickfunnels have put together an amazing combination of training and tools to get you up and running quickly even with little or no experience in Sales Funnels or online marketing. The Funnel Builder Secrets Masterclass itself – Over 10 modules this program teaches you to become a pro-level funnel builder covering everything from strategy to offer creation and more. Traffic Secrets Training Program ($1997 value) – Discover and learn about hundreds of potential traffic sources for your Sales Funnel and website. Get up to speed on how they work and which ones would work best for you and your business. 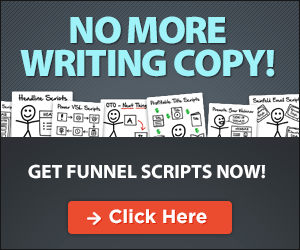 Funnel Scripts (12 months access $497 value) – Probably one of the most underrated tools out there. This will help you rapidly write the scripts for your sales pages, emails, facebook ads, sales videos and even Webinars. Spy for Profit (Funnel hacking 201) ($997 value) – Not sure where your competitors are getting traffic from? Spy for profit will teach you how to uncover these traffic sources. Allowing you to reverse engineer already successful processes to generate traffic and sales for your Funnels. As if all of that wasn’t enough you get a Clickstart onboarding call with one of the awesome Clickfunnels team. They will help you kickstart your Funnel Hacking journey. So as you can see this is thousands and thousands of dollars of value. An amazing way to level up your existing business or accelerate your new business with this awesome training. If you really want the whole deal with all the bells and whistles (no actual bells or whistles will be provided). Go ahead and grab the whole package by clicking the link below.